It’s official: I am overdue. Just like a library book racking up fees while it hides under the couch. Except that I do not fit into sneaky, skinny spaces so much, and no one is forgetting about the deadline that we passed. Except maybe the baby. Maybe she forgot? Maybe she is frantically trying to throw on another pound before she feels ready. But in truth, being overdue is not so bad. I can feel free to lie down on the couch in the morning and doze off, waking periodically to give the kids more pretzels while they watch cartoons. When else would we consider that sort of mothering par for the course? I also like the feeling that we are coming up on a real finish line (instead of this illusive one we already passed). The end really, really, really must be near now! Compared to the last time I was pregnant, I don’t even feel all that weighed down! Here we are now. 3 days overdue. And now – brace yourselves – here comes the one of me 4 weeks early with the twins. Thank you for your humor and light spirit. This made my heart laugh. As one who does feel more weighed down this time round, it’s good to be reminded that a cheerful heart does a lot of good. May your labor be a safe and joyful one! Why you hardly look pregnant at all! All of my kids arrived late, and yet they were right on time. God bless! How delightful! Here’s hoping your newest bundle will appear soon! Anticipating the great news! May God bless you. You look pretty amazing for being overdue! I start to look somewhere between peaky and death the last couple weeks. People give me knowing looks and try to say nice things. Way to do cute braids, too! I’m just starting to do my girls’ hair again, and my baby (#5, also known as Edmund) is almost two. And weren’t both those twins like 8 lb. each or something? You had like 16 pounds of baby that time! Incredible. You are amazing! Such a cheerful trooper! And so beautiful! Sending Love to you!!!! You look wonderful! We’re praying for a safe delivery! I am always rather fanatical about having freshly painted toe nails pre-birth, I have this almost neurotic fear of being in labor, almost at the perfect birth-bonding moment only to look down and see chipped up polish….shudder. Not sure where this paranoia comes from but I have it every time. Thanks for the pics, so fun! You do look amazingly fresh for an overdue mom! Just a bit over 16 yrs ago I was overdue with my first. I had a dream that I was standing on a subway platform, and the train full of babies came blazing past….didn’t even slow down. I was left standing alone on a silent platform, enormously pregnant. The message was clear….the train had gone and I would be pregnant forever. So funny to remember that now! Anyhow, I hope you will have an easy delivery and a happy peaceful baby….maybe today. What a great attitude! I haven’t had an overdue one yet, but I hope I can be half so cheerful if this one is. I think your cardigan is my favorite shade of blue. Missy, that dream is hilarious! Love that shot with the twins! We are praying for you and the little lady, can’t wait to meet her!! See ya on the other side! you are a super cute, amazing mother by God’s grace! i am amazed at the number of women having more than four children these days. God bless you as your endeavor to train them all for His glory. Well, I’ve walked down part of the road that you have traveled. I had twins a little less than six months ago; I thought 11 pounds of baby was a lot! You may be late, but two things you can look forward to….1) you’ll more sleep this time around and 2) you won’t have to answer people when they ask if your boy/girl twins are identical! You look pretty amazing with the twins there. And awful sleek and agile now! A friend of mine is 2 weeks overdue now (her first though, I know you won’t go that long! Don’t want to make you feel bleak by pulling out the Lady-Who-Went-To-44-Weeks stories.) We’ll add you when we pray for her. I am stunned! I’ve never heard of twins that weighed in the 7-lb. range. My husband’s dear grandmother gave birth to 6.5-lb twins back in the ’30s, (she was a big lady, and they were her #7 and #8) and I thought that must’ve been some kind of record! And yet now you have just a small bump! Your nickname needs to be ElastiGirl! I love how your belly is the focus of the first picture. 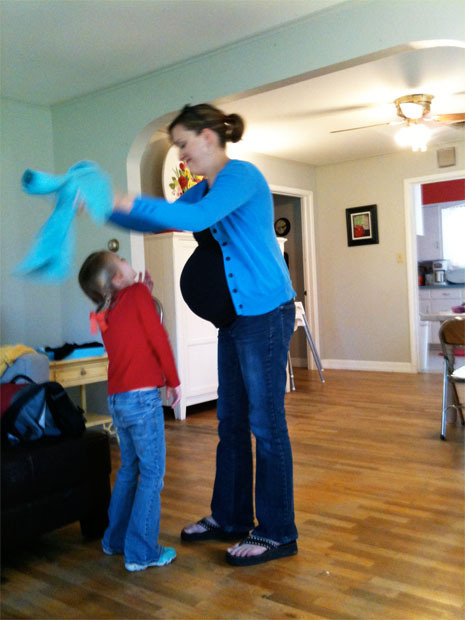 All the motion and then…the belly! You look adorable! I must admit it looks as if you have pillows in your shirt with the twins, but you still look amazing. Rachel, I love that you described the second photo as a head sitting on top of a mountain! Hilarious! 🙂 You’re so fun. I still crack up about your husband patting/walking a non-existent baby in his arms when you were both so sleep deprived from the twins;-) You look beautiful and well-rested; I am looking forward to seeing another cutie added to your family! Blessings to all of your family with your new bundle!! Oh Rachel, you dear girl. The twin pic almost does not seem possible. But you did it so beautifully! Congratulations on your new precious bundle of pink. Her name is so lovely, as is her beautiful mother. Enjoy!! !